There are a few ways to seem like you've recently crept out from the depths of the earth's crust to gather souls. You could throw on a red velvet lined cloak and set up buckets of dry ice where ever you go for dramatic entrances. You could also try painting that old pitchfork red and show up at after-school detention to make those spitball-throwing kids toss away their grody straws forever. None of these actions communicate a demonic aura quite as well as a classic red devil face, artistically achieved with this wild, red face paint kit. 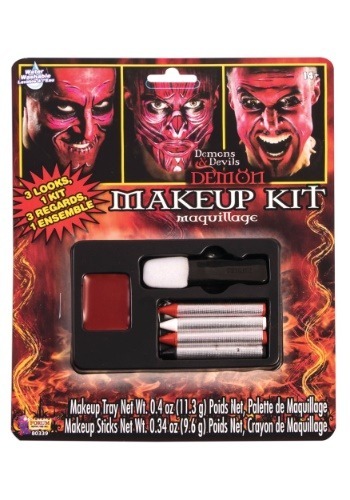 This Halloween, choose from three different designs with this makeup kit. You'll receive a makeup tray with an applicator, a dark red base coat, and four detailing crayons including two red, one black, and one white for accent lines. The makeup goes on smoothly and washes off with water at the end of the night. If you're stepping out as the Prince of Darkness this Halloween, you're going to need a fierce look. Leave your human form behind with this flaming paint. While we can supply you with detailed, high-quality makeup, it's up to you to work on that evil devil cackle!